2nd & 4th Thursday at 7 P.M.
Camp Pride for children and adults with mild through profound special needs in New Durham, NH. 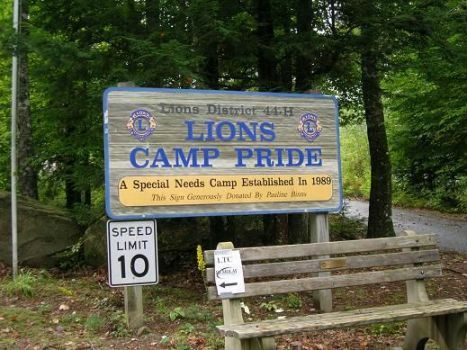 The Plaistow Lions have regularly donated time and services to Camp Pride. A recent visit cleared shrubs around the showers, added new signs on the showers. Accompanied by a Kubota some of the guys cleared some bigger trees around the camp as well as move a big rock to help redirect water runoff around the shower. Join the Camp Pride Board of Directors at their meetings on the 2nd Wednesday of the month. Contact Bill Willis for more information.